Cocaine has had a long and prominent position in the history of American substance abuse. As far back as the late 1800s cocaine was commonly found hi patent medicines, elixirs, and, astonishingly, in the earliest versions of Coca-Cola. Eventually, the potency of cocaine was recognized and its purveyors came under gradual regulation. Events hi the early 1900s kept cocaine use down until World War II, but the extensive drug use of the 1960s once again sparked a national temperance movement. Created in 1989, the Office of National Drug Control Policy maintains responsibility for coordinating and monitoring the nation's countemarcotics policy. But responsibility for coordination and monitoring is not the same thing as control. In Snow Job? Kevin Jack Riley examines source country control policies—policies intended to control the production and export of cocaine from Latin America—and their limitations. Part I draws together drug use, drug production, and drug control policies hi an analytic framework. It goes on to examine the recent history of U.S. drug control policies, source country control policies, the ways hi which cocaine prices affect cocaine use, how cocaine is made, and the vulnerable points in its production. Part II examines the economic effects that production and controls exert on the sources of cocaine—Bolivia and Peru—and probes the Colombian drug lord connection. Part III prescribes an appropriate path for source country cocaine policies and examines their implications for two other widely smuggled drugs, heroin and marijuana. 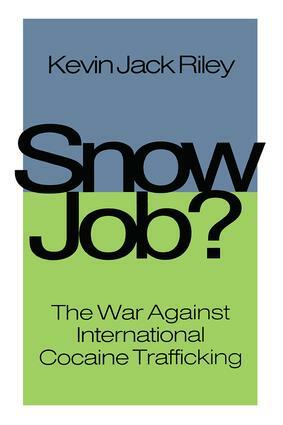 Riley disagrees with analysts who believe that source country control policies can lead to permanent victory hi the war against cocaine, because of the potentially high costs associated with implementing source country control policies on a large scale. He suggests a better strategy would be one that recognizes the severe limits facing interdiction, eradication, and other source country policies, and instead focuses on directing source country resources where they will be most useful. This necessitates defining a regional strategy that elevates political stability and institution building, and demotes traditional countemarcotics objectives. Snow Job? offers original thinking and practical approaches to a multidimensional world problem and will be of interest to policymakers, political scientists, sociologists, and law enforcement officials. 1. We Have Met the Enemy . . .
2. . . . And it is the U.S.